Due to dissatisfaction with the current Atom processor roadmap, Intel CEO Paul Otellini believes that the original roadmap should be changed to find a new center, while Paul Otellini said that the company has accelerated the design progress of the new Atom processor and said that Intel One of the companyâ€™s goals is to deploy Atom processors on smartphones and tablet devices. 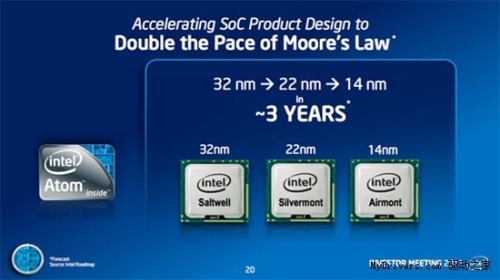 Subsequently, Paul explained that the company plans to release the 14nm Airmont Atom processor in 2014, which is the 14nm manufacturing process made its debut in the Intel mainstream CPU. Intel's Atom chips are also manufactured using 45nm technology. It is reported that Intel's Atom processor based on 32nm manufacturing process is expected to be launched in the fourth quarter of this year, and the first 22nm Tri-Gate "3D Transistor" Atom chip Silvermont will be launched in 2013. Starting from the 22nm process, Intel will change the power range design of the Atom notebook, and the design goal will be reduced from 40W to 15W. In addition, the company will also provide a large number of system-on-chip solutions to cover the 1W to 10W range of chips. Paul also announced that Intel will design smart phone chips based on the Medfield chip in the first half of 2012.